"Are you happy with the way that you spend money?" Whether you're on a date, on the phone or on vacation, there is no better way to learn something new about someone than by asking questions. 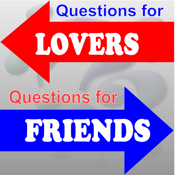 If you met yesterday or last century; if you're lovers, just friends, or lovers and friends [good for you], this app puts the joy of asking and answering good thought-provoking questions in the palm of your hand. If you are friends, swipe right and the app will select a random question about past experiences, lifestyle choices and future wishes. If you are lovers, swipe left and the app will ask about... past romantic experiences, romantic lifestyle choices and future romantic wishes. If you want to mix it up, shake your device and the app will choose which category to ask. The app keeps track of which questions have been asked, so there won't be any repeats. If you end one relationship and start another, just reshuffle the questions. And if you like a question, add it to the "favorites" list, which you can view any time from the home screen. If you come across a great question not in the app, you can now upload it for other couples to enjoy as well. So go ahead, turn the TV off and get to know the person sitting next to you. You won't regret it.